The new Shipping Zone Methods page, added to WooCommerce 2.6, allows to change the settings of each shipping method more quickly. 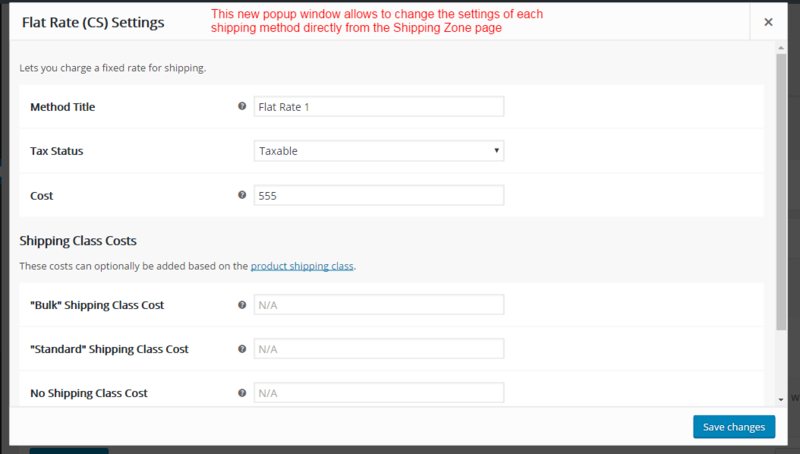 The new popup window that opens when clicking on a shipping method on the Shipping Zone Methods page, in WooCommercw 2.6. This presented a significant challenge to us, for our Shipping Integration was not designed to take into account the presence of such library. Although our plugin worked fine, even in WooCommerce 2.6, with the classic user interface, handling this new popup required a significant amount of work. Backward compatibility is of paramount importance to us, and we couldn’t just rewrite everything using the new library. Basically, we needed to find a solution that would work with WooCommerce 2.6 and earlier versions, seamlessly. Needless to say, we found a solution (at least, until new breaking changes are introduced). Our multi-currency selector can now work directly from a Shipping Zone Methods page, as well as on the popup window. We didn’t touch the Backbone code, as we find it too hard to tweak, and relied on a “trick” instead. The currency selector is now available on the Shipping Zone Methods page. 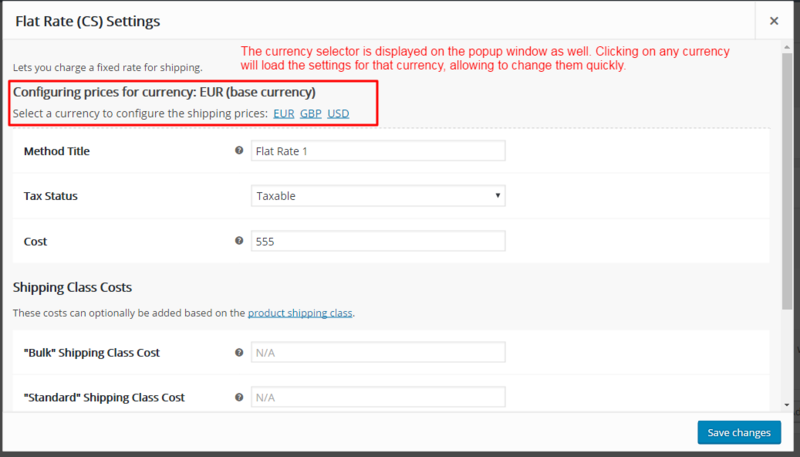 The currency selector is displayed in the Shipping Method Settings popup, allowing to switch currency on the fly. As you can see, we tried to keep the original interface as much as possible, and added our elements in a separate area. Simplicity is the key! Fixed calculation of currency specific shipping in WC 2.6 Beta 2. The calculation was broken by unexpected changes in how shipping methods are handled when they are assigned to a zone. The new shipping zones are a new concept, and they seem to be a bit of a “moving target”. We will work on fixing all the bugs caused by breaking changes as soon as we discover them. Added logic to handle of EDD fees. We helped the EDD team extending the core of Easy Digital Downloads to allow the processing of fees, which may be added by 3rd party plugins. This new feature will make it possible to add multi-currency support to plugins like Simple Shipping and Recurring Payments. Code cleanup. Conditionally removed filters that are obsolete in the new versions of EDD. Added logic to prevent double conversion of variations’ prices. Fixed minor bug that could cause the historical order totals to appear as zero. As active contributors of several communities, such as the Advanced WooCommerce and WooCommerce Help & Share groups on Facebook, we came across a question that seem to be quite frequent. This operation is simple, it just requires a bit more work than one would expect. 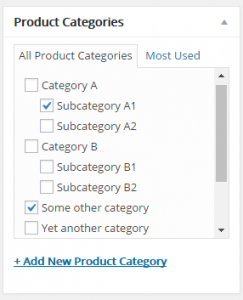 It’s very easy to fetch the categories to which a product is assigned directly, but a product may also belong to parent categories (a parent category is a category to which a subcategory belongs). The screenshot below explains the concept. In this example, the product belongs directly to “Subcategory A1” and “Some other category”. It also belongs indirectly to “Category A”, as “Subcategory A1” is a child of that category. Directly to Subcategory A1 and Some other category, as it’s assigned directly to them. Indirectly to Category A, which is the parent of Subcategory A1. Now that the concepts are clear, let’s get coding. All good, we have the categories to which the product is assigned directly. Now we need to get all the parent categories. To keep things tidy, we will create a second function to get the parent categories of a category. This requires a similar approach to the one used for the products. As before, we have a list with category slugs as keys, and category names as values. Time to finish the job. That is, a list of all the direct and indirect categories to which a product belongs. Mission accomplished! For your convenience, you can find the complete code here: WooCommerce – WooCommerce – Get product categories, including parent categories (Pastebin). Should you need help implementing the solution, or if you would need to have the category search functions implemented as part of a more complex custom project, please feel free to contact us. We will review your specifications and give you a quote for your customisation. 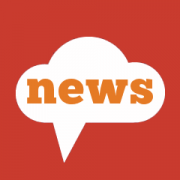 We are delighted to inform you that a new plugin joined the multi-currency family. The SIP Frontend Bundler, developed by ShopitPress, now includes full support for our ever popular Currency Switcher for WooCommerce. Together, they will grant you unprecedented flexibility in offering attractive bundles to your customers, helping you increasing your revenue. What can the SIP Front End Bundler do for you? In short, it allows your customers to configure and buy product bundles, straight from your front page. The price is updated in real time, so that the buyer can immediately see how much he is going to spend, and adjust the bundle accordingly. Easy to explain, easy to use! No need to spend time creating pre-configured bundles, one by one, hoping to get it “just right”. 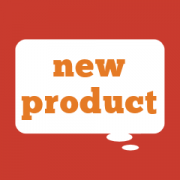 Just select the products that can be bundled together, and let your customers create their own set. Customers like to know in advance how much they are going to spend, possibly without having to manually compare multiple product combinations. The SIP Frontend Bundler will show them how much they are saving in real-time, as the customer build its own bundle. The SIP Front End Bundler for WooCommerce can show the bundle builder in any page on your site. Your customers will love to create their own bundles right from the front page, instead of having to go through a long catalogue. Thanks to the collaboration between Aelia and ShopitPress, the SIP Front End Bundler includes full support for our Currency Switcher for WooCommerce. Sell your bundles in multiple currencies and increase conversion! Multi-currency Bundles in WooCommerce, made easy! This is another great result of a collaboration between teams who share the same vision, and who recognise the importance of being able to offer your products to a worldwide audience, catering to a large range of needs. Just like our Currency Switcher for WooCommerce, which was born to grant customers the flexibility to pay in their preferred currency, the SIP Front End Builder grants them the freedom to create their own special offers, quickly and easily. We would like to thank the ShopitPress team for the effort they put in developing such a powerful, yet easy to use solution for the management and creation of bundles. Well done, and keep up the good work! If you are a plugin developer, and would like to learn how to add multi-currency capabilities to your products, please feel free to get in touch. We will be happy to give you the information you need for a quick start, as well as examples that will simplify the integration with our Currency Switcher for WooCommerce. You will join the ever-growing list of teams who support such an important feature, amongst which you can find SkyVerge, Prospress, YIThemes, ThemeComplete and, of course, ShopitPress. Thanks for reading, and see you soon for more great news! As announced earlier, we have been working to add multi-currency support on the Composite Products plugin. Thanks to the collective efforts of the Team, we are proud to announce the release of the first version of the WooCommerce Composite Products Integration Addon. Like the addon for the Bundles and Subscriptions integrations for WooCommerce Currency Switcher, the addon is now available for download, free of charge. This new addon extends the WooCommerce Composite Products plugin, adding some multi-currency capabilities to it and integrating it with our popular multi-currency solution, the WooCommerce Currency Switcher. This addon will add features such as automatic conversion of composite product prices and manual pricing of each composite product, in multiple currencies. Although our objective is to allow plugins such as Bundles and Composite Products to implement native support for multiple currencies, we released this extension as a temporary solution. This will grant the original plugin’s authors more time to add such features to the official releases of their products. Installing this plugin is as simple as uploading and enabling it. The multi-currency features will be applied to the Composite Products plugin automatically, no configuration is required. The Composite Products Integration is currently in Beta. If you find any issue while using it, please feel free to report it, and we will look into it. If you find this addon useful, we would like to ask you to consider buying a support plan for it. Free addons come without support. By purchasing a plan you will get access to our top class support service, and you will help us keeping the plugin up to date. Have fun with another high quality solution from Aelia! Following multiple requests from our customers, we have been working with the developers of the Bundles and Composite Products plugins to introduce full compatibility with our Currency Switcher for WooCommerce. Support for bundles is currently provided by our free Bundles Integration Addon, which will work as a temporary solution while SomewhereWarm, the authors of the Bundles plugin, update their product. It may take a while before the same features are ported to the Composite Products plugin, therefore we decided to start testing that plugin in our environment, to determine which features should be added to make it support our Currency Switcher. The prices of components are converted correctly. The conversion is performed on each component individually, before its price is used, and each component uses its currency-specific prices, where applicable. Product’s base prices (regular and sale) are not yet converted. These values have been introduced recently, and they will have to be passed to the conversion functions. The price of the composite product is converted correctly, using exchange rates. The prices in each currency are not saved, as the product requires a special processing for that purpose. 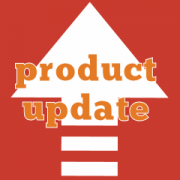 We are going to run more tests and give the authors of the Composite Products plugin the information required to address the issues reported above. Should we find out that it could take too long, we will try to write an addon, like the one we wrote for the Bundles plugin, as a temporary solution. If you would like to be informed when the addon is released, or you would like to contribute to its development, please feel free to contact us, and we will send you more details. The Composite Products Integration is now available, free of charge!